The Arduino TRE is a Sitara-processor-based Linux Arduino plus a full AVR-based Arduino, while leveraging the simplicity of the Arduino software experience. The integration of the AVR Arduino enables the Arduino TRE to use the existing shield ecosystem so that innovators can expand the Arduino TRE to develop a wide range of high-performance applications such as 3D printers, gateways for building automation and lighting automation, telemetry hubs that collect data from nearby sensors wirelessly, and other connected applications that require host control plus real-time operations. In addition, the Arduino TRE is partially the result of a close collaboration between Arduino and the BeagleBoard.org foundation. These open hardware pioneers share a passion for expanding open source development and making technology accessible for artists, designers and hobbyists. Arduino TRE design builds upon the experience of both Arduino and BeagleBoard.org, combining the benefits of both community based boards. 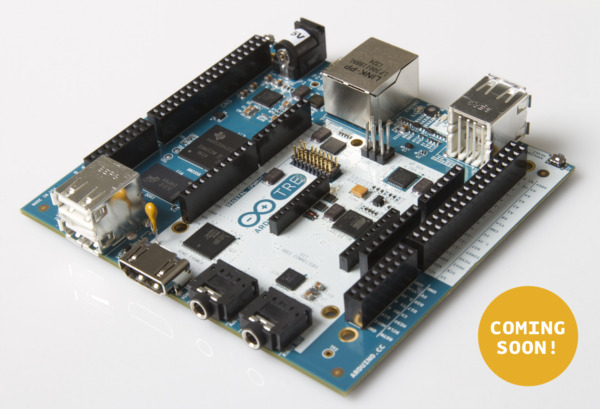 Arduino TRE final board will be available within a few months, pending results of Beta Testing Program. Купить то можно, вот только не понятно,что из него сделать можно,и зачем это нужно. За такие деньги это мертворожденный проект. Понимаете, для буржуев 300 баксов-это другие деньги в отличие от нас. Поверьте что буржую неплохо считают свои деньги и 300 баксов это очень много на фоне расперей пи и всяких ведроидных поделок за куда меньшие деньги и значительно большей производительностью.